Charge Island in GTA IV, as viewed to the southwest. Charge Island is a small island featured in the Grand Theft Auto IV and Grand Theft Auto: Chinatown Wars renditions of Liberty City. Based on Ward's and Randall's Island, Charge Island is officially part of the borough of Dukes in the Humboldt River, lying between Algonquin to the west, Dukes to the east, and Bohan to the north. The size of the island is roughly on par to that of Colony Island further south. Charge Island is almost entirely dedicated to industrial activity, the enormous East Borough Bridge and water treatment facility (also suggested to be a desalination plant) make it decidedly unappealing for residential development; in addition to the abovementioned bridge foundations and water works, the island features a boathouse and cargo dock to the northwest, a fuel repository to the east (with an oil tanker docked there at the time of Grand Theft Auto IV), and a baseball field to the northeast that is identical to the one in Meadows Park (The island's baseball field might be based off Icahn Stadium). A little forest with a creek is also present in the west part of the island; the small creek is similar to the Little Hell Gate in the middle of the island, while the unnamed channel to the east is comparable to Hell Gate in Astoria. The shorter channel on the northern tip of the island is presumably based of Bronx Kill, although Bronx Kill is much narrower in reality. Much of Charge Island is situated in the shadow of the East Borough Bridge which connects Dukes, Bohan and Algonquin. As a result, the island is primarily accessible via the bridge through three onramps between the Dukes-Charge Island span and the Algonquin-Charge Island span; two ramps leading to the southwest corner of the island are located just south of the bridge's tollbooths, while the third ramp to the eastern side of the island is located north of the tollbooth, off the southbound lane. Charge Island's position in relation to Liberty City's other islands. 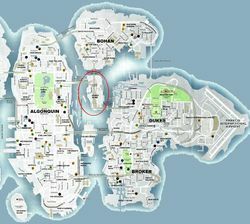 The island is featured twice in GTA IV's storyline, in the missions "Diamonds Are a Girl's Best Friend" and "Catch the Wave", as well as The Ballad of Gay Tony's "Ladies Half Price", which plays out events of "Diamonds Are a Girl's Best Friend" from a different perspective. The island's baseball field is also the destination in the Hangman's NOOSE multiplayer mode. The Charge Island desalination plant is also the primary location of Grand Theft Auto: Chinatown Wars's climatic mission ("Salt in the Wound"), where Huang Lee pursues his uncle Wu Lee through the plant while being aided by Wade Heston. In GTA IV, a parking lot in Charge Island is one of Little Jacob's gun car spawn points. This page was last modified on 9 September 2012, at 17:34.